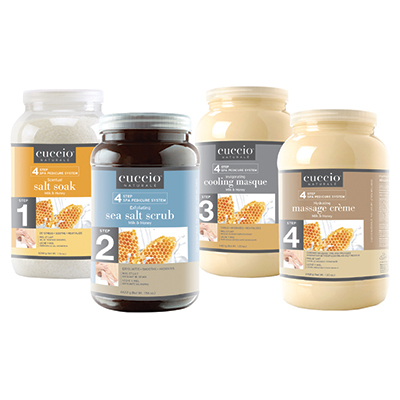 This complete four step spa kit leaves skin feeling soft and polished for the ultimate spa experience. Honey naturally soothes and moisturizes, while lactic acid from milk refreshes and stimulates the skin. Includes: Milk and Honey Soak (1 gal. ), Milk and Honey Sea Salt Scrub (1 gal. ), Milk and Honey Cooling Masque (1 gal. ), Milk and Honey Massage Creme (1 gal. ).